After my mini meltdown yesterday (as seen on Snap) when Grandma took Jordan to her house, I had to pull myself together and get focused on getting ready to get out the door. I managed to make it to the grocery store, prepare all of Jordan’s food for while I’m gone, make my hubby a lasagna, clean the kitchen, put away the clean laundry, pick up James from school and help him with his homework, do a photo shoot, pick up my new iPhone and get it installed, write this blog post and get packing! Please remind me never to try to cram so much into the day before going out of town again! #whatwasIthinking?! But now, I’m getting so excited to see old friends again and meet new ones! Cassie and I are roomies again and I can’t wait to see Sarah, Emily, Jennifer, Ibie, Cyndy, Jennifer, Julia, Jen, Samantha, and Rhoda. We’ll be missing Courtney, Gwen, and Kristin though, all of whom, unfortunately, couldn’t make it. Especially since this is a Better Homes & Gardens event, I’m honored to even be included among the attendees! And I know I’ll leave these women feeling inspired by all their talent and creativity. It’s perfect timing too, since Fall tends to bring all those cozy home feelings with more attention on being inside and hopefully, finishing up some home projects over here. Some of the best advice I got was to definitely check the weather because it can be hot during the day and then in the 50’s at night and also to bring comfy shoes. Isn’t it true that we are so miserable when our feet are killing us?! And right now we’re hearing chance of rain, but I hope it holds off. I wanted to bring all seven pairs of shoes below and keep the leopard ballet flats in my bag for emergencies. But, as I’m packing, I’m running out of room, so we’ll see . . . So, I’ve got my mani/pedi complete – obsessed with this color – Shhh, It’s Top Secret. It’s a super deep dark brown, but looks like soft black. So pretty for Fall! I also did two days of self tanner and got a new Fall lip color (“Vamp”)! This lipgloss is highly pigmented, goes on smooth and smells great. I got a new lip color for Cass too “Sugarplum”, so appropriate, dontcha think?! 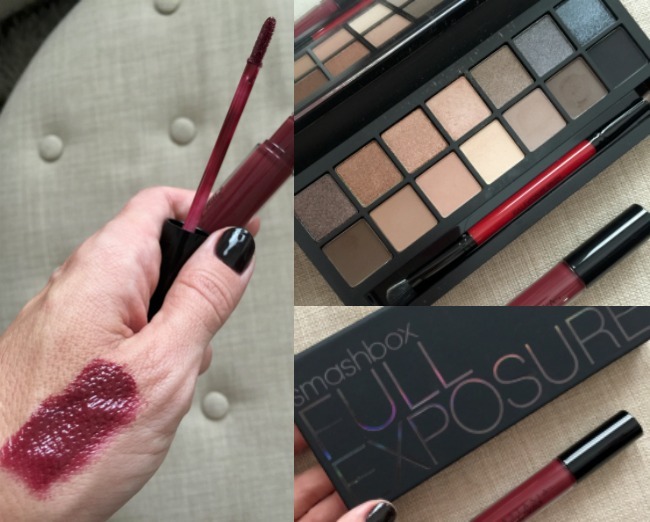 The eye shadow pallet is new from Smashbox – full of gorgeous neutrals and a few stunning smokey grey-blues. 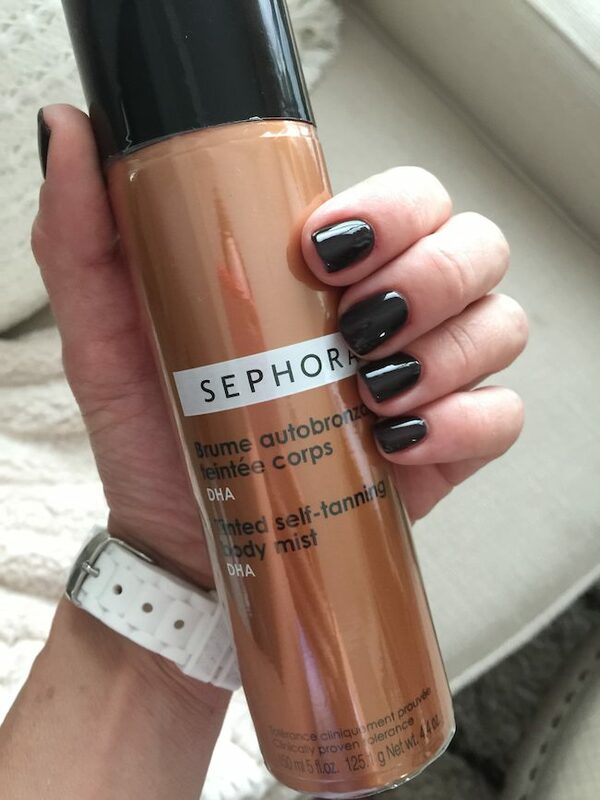 This spray-on self tanner by Sephora is my go-to. It sprays on evenly and smells nice, but most importantly, it creates nice color. If you step into the shower to spray it, you won’t get any on your bathroom floor. And there’s a better picture of the nail color. As for the outfits, most of you loved the burgundy A-line dress, the black lace dress, and the jumpsuit that I already owned. I took your advice and got the A-line dress taken in to be altered (taken in at the waist) and the black one was a little big in the hips. Unfortunately, the zipper on the black one was buckling and the alterers are having to replace it and it won’t be ready in time. In it’s place, I’ll bring the black and white lace dress. I’m still so super crazy about the patchwork skirt, but I returned it in exchange for a 0 and it’s not here yet. I thought I was on it early, but lesson learned, you really need to shop at least 2-3 weeks in advance of your event to allow time for alterations/exchanges! I like to be comfy on the plane, so I’ll probably wear these black skinny jeans and my Nikes, and definitely bring my favorite jean jacket and one of these totes that hold my computer and camera because I’m too afraid to check those. 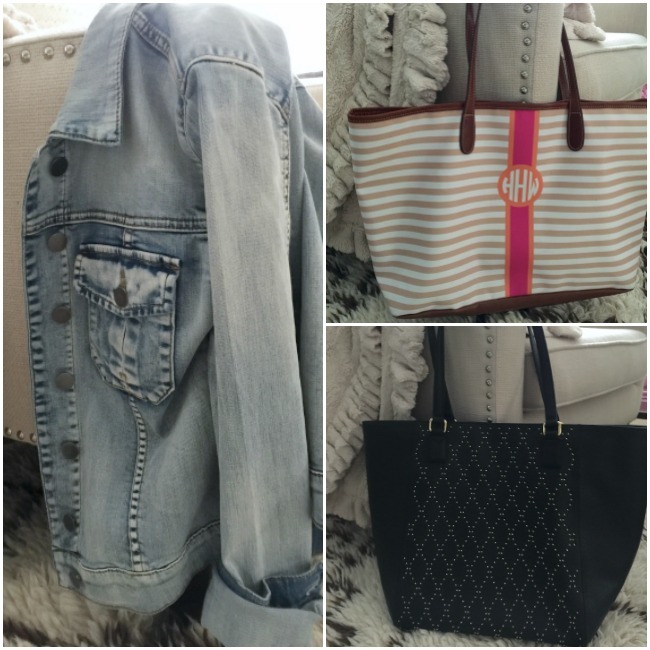 The striped Barrington tote (you can customize color, pattern and monogram) is more lightweight, but the black studded Vera Bradley tote goes better with my outfits and is a little bigger. Last time I traveled to Dallas, I forgot my jean jacket and was dying without it on the plane! When you find a dress that makes you feel pretty, you know it’s the one. I love the feminine style of this dress, the color is outstanding and the pleated ruffles at the neckline and cap sleeve are flattering and draw your eye up. I only had to take in the waist a smidge, but we left the length as is. I thought I’d sass it up with these colorful patchwork heels that are actually very comfortable. 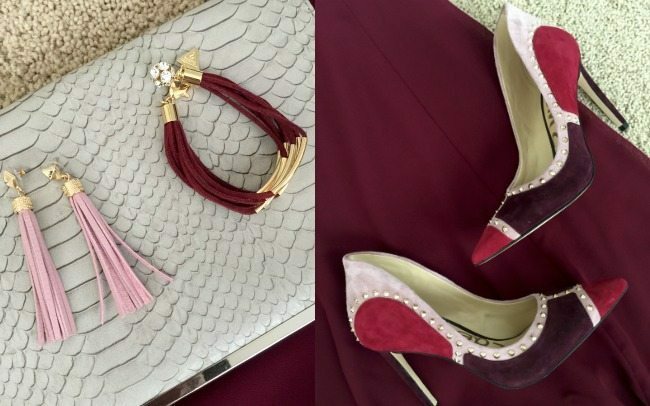 All of the Sam Edelman shoes I have are well made and fit well. After the BH&G Stylemaker event, they’re hosting a cocktail party. I got this patterned dress at House of Harper’s shopping event a couple weekend’s ago and it’s by Hunter Bell, who recently moved from NY to Houston. I think it’s edgy with the pattern and fringe and will be perfect for NYC. It’s got pockets too and because of the mock collar, I’ll probably skip the necklace and just wear these earrings. We haven’t decided where we’re going to dinner yet, but always open to suggestions. We’ll be in Manhattan near Gramercy Square, close to Union Square subway station. The back has a sweet cutout, but is low enough that you can still wear a bra with it. I might be overdressed in this dress, but I also loved it, so I wanted an opportunity to wear it in NY. I don’t get all that many opportunities to dress up lately in Houston. As much as I like getting all dolled up, I’m most comfy in my old jean shorts! I’m sure my feet will be begging for flats or sneakers by this time. And we’ll be doing some walking, so I want to enjoy it! I’m super excited for this Food & Culture Tour- it’s in Greenwich Village and you get to explore neighborhood cafes and specialty food shops and taste cuisine from around the world. #yum! If it gets chilly (it’s supposed to rain), I could switch out the shorts for black skinny jeans and lightweight bomber jacket. We’ll be going to see a broadway show, Waitress, on Friday night! It’s a musical featuring original music and lyrics by Sara Bareilles. It’s the story of a pie-baking waitress who’s expecting her first baby and wondering how motherhood will affect her career. Baking, babies, and music sounds right up my alley. Should be a great show to see with girlfriends. I don’t think we have dinner reservations yet, but I do know we’ll be eating late, I think around 11 pm. #hopeIcanhang! You better believe I’m taking my Cozy Soft Pants! #dontleavehomewithoutem! And this robe. And isn’t it cRaZy how much stuff my Mom had to take with her to watch Jordan? 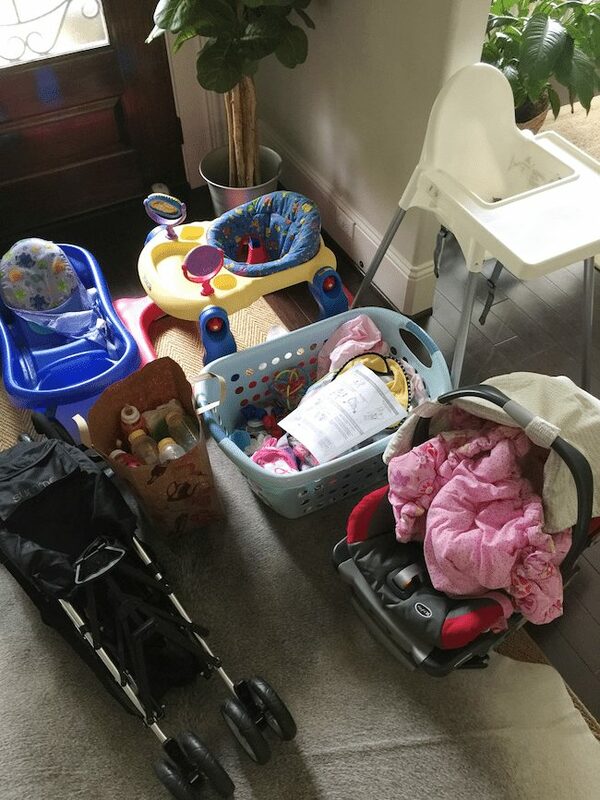 This doesn’t even show the big box of diapers and wipes she took the day before! She ended up leaving the highchair though because it wouldn’t fit and took the bumbo and tray instead. I wouldn’t be comfortable leaving Jordan with anyone but my Mom (of course my husband, but he has to work). I’m already missing her like crazy, but on the phone I’ve heard Jordan laughing and I know she’s getting spoiled rotten! Okay guys, I’ll catch ya on Snapchat or Instastories while I’m gone! And I post everyday outfits on Instagram and Facebook and love connecting with you there! If you want to shop my outfits without LikeToKnowIt, just go to the SHOP tab at the top of my blog and click on the picture for direct links to what I’m wearing. #howeasyisthat?! Very cute and I know you will have a great time. Just a thought- maybe wear the lace dress to the cocktail event and the blue fringe dress to the C&B event? Also, I am in the Midwest and we are low to high 60s during the day and lower at night. You probably won't need the shorts, but as a Texas girl, you will definitely want a jacket, wrap, sweater every time you go out. Brought jackets, might get chilly! I don't think the shorts are the best idea. A nice pair of skinny jeans is the way to go right now in NYC. Have a great time!! Brought both, I'm sure I overpacked! 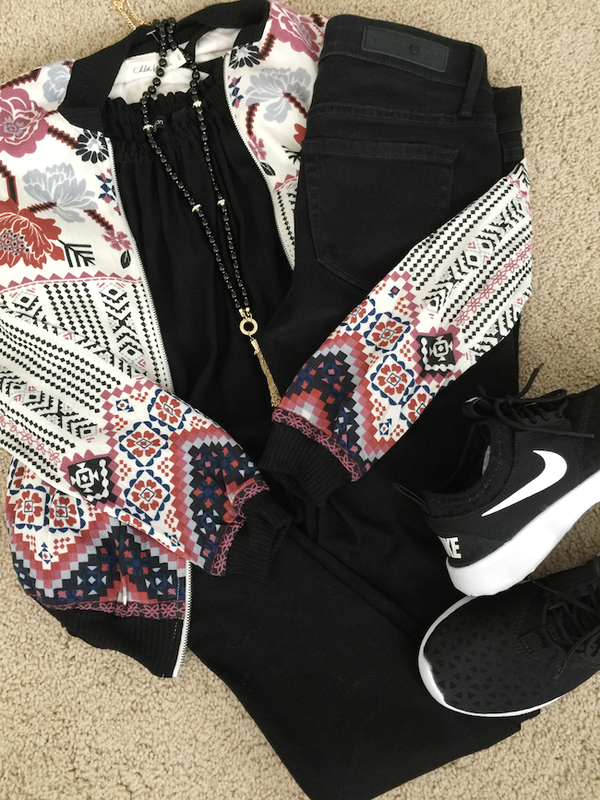 Super cute outfits–and so fun! NYC in the fall is just dreamy. Enjoy your trip! You're going to look gorgeous!! Have so much fun! YAAAASSS to that Hunter Bell dress! Glad you're embracing the funky! Have so much fun! You should try letting Jordan lay down in the big bathtub! Such a fun thing for babies that age to do (my daughter is just a month older than Jordan). I put only an inch of water or so in the tub and kneel right next to it to catch her if she rolls and she kicks and wiggles and loves it so much.. and my son did too at that age! Plus no more baby tub! I think she's about ready since she's sitting up! She loves splashing around now! Oh my gosh, I wish I read this in time! Thanks for the restaurant recommendation!! Will keep it in mind!